Complete endpoint defense integrating protection, detection, response and remediation for all types of threats in a single solution. Panda Adaptive Defense 360 is the first and only cyber-security solution to combine the most effective traditional antivirus and the latest advanced protection technology with the ability to classify all running processes. Adaptive Defense 360 is a detection and response service that can accurately classify every process on all your company's endpoints, allowing only legitimate programs to run. Continuous monitoring of all processes on a company’s computers and servers. Automatic classification using Machine Learning on our Big Data platform in the cloud. Technical experts who analyze all processes that are not classified automatically, to evaluate the behavior of everything that runs on your systems. Defending the endpoint against attack is hard. Protection must include a wide range of defenses including traditional antivirus/anti-malware, personal firewall, Web & email filtering and device control. And, any defense must provide additional safeguards against difficult-to-detect zero-day and targeted attacks. Up to now, IT has needed to acquire and maintain a number of different products from different vendors to defend the endpoint. 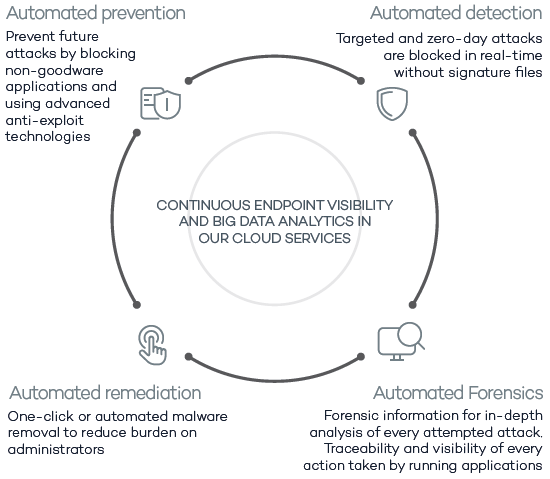 Adaptive Defense 360 is the first and only offering to combine Endpoint Protection (EPP) and Endpoint Detection & Response (EDR) capabilities into a single solution. Adaptive Defense 360 also automates capabilities reducing the burden on IT. Adaptive Defense 360 starts with Panda's best-of-breed EPP solution which includes Simple and centralized security, Remedial actions, Real-time monitoring and reports, Profile-based protection, Centralized device control, and Web monitoring and Filtering. However, that is only the beginning. The malware and IT security environment has undergone major changes in terms of volume and sophistication. With over 200,000 new viruses appearing every day, and the sophistication of techniques for penetrating defenses and hiding malware, corporate networks are more vulnerable than ever to zero-day and targeted attacks. Traditional Endpoint Protection solutions are efficient at blocking known malware by using detection techniques based on signature files and heuristic algorithms. However, they are no defense against zero-day and targeted attacks that take advantage of the 'window of opportunity for malware,' the time lapse between the appearance of new malware and the release of the antidote by security companies. An increasing gap that is exploited by hackers to get viruses, ransomware, Trojans and other types of malware into corporate networks. Such increasingly common threats can encrypt confidential documents and demand a ransom, or simply collect sensitive data for industrial espionage. Adaptive Defense is Panda's solution to these types of attacks. Adaptive Defense provides an EDR service that can accurately classify every application running in an organization, only allowing legitimate programs to run. The EDR capabilities of Panda Adaptive Defense 360 relies on a security model based on three principles: continuous monitoring of applications on a company's computers and servers, automatic classification using machine learning on our Big Data platform in the cloud, and finally, our technical experts analyze those applications that haven't been classified automatically to be certain of the behavior of everything that is run on the company's systems. These capabilities are now combined with the best-of-breed EPP solution from Panda, closing the cycle of the adaptive malware protection, which now includes automated prevention, detection, forensics and remediation. Are you keeping your business data secure? Confidential data, accounting systems, passwords, customer databases... Bear in mind that eventually someone will try to steal these things. The real question is, will you be able to stop it? 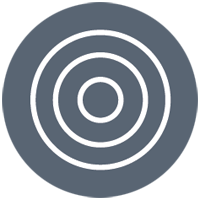 Panda Adaptive Defense 360 provides you with a genuine answer to your needs. With Adaptive Defense 360, we monitor and classify all YOUR software to make sure we discover and stop all malware in YOUR systems. Adaptive Defense 360 provides automated remediation, real-time monitoring and reports, profile-based protection, centralized control of devices, as well as Web monitoring and filtering. Standard Mode allows applications classified as goodware to run, as well as those that are yet to be cataloged by the automated systems and Panda Security. Extended Mode only allows the execution of goodware. Extended blocking is the ideal form of protection for companies with a ‘zero risk’ approach to security. Execution event graphs give a clear view of all events caused by malware. Identify and locate the software vulnerabilities on your network. Centralized device control: Prevent malware entry and data loss by blocking certain types of devices. Antivirus and anti-spam for Exchange Server. Endpoint firewall, and much more. Standard mode allows all applications cataloged as goodware to be run, along with the applications that are yet to be cataloged by Panda Security and the automated systems. Extended mode only allows the running of goodware. This is the ideal form of protection for companies with a 'zerorisk' approach to security. View execution event graphs to gain a clear understanding of all events caused by malware. Get visual information through heat maps on the geographical source of malware connections, files created and much more. Locate software with known vulnerabilities installed on your network. Adaptive Defense can coexist with traditional antivirus solutions, and take the role of a corporate tool capable of blocking all types of malware, including targeted and zeroday attacks that such traditional solutions are unable to detect. Systems such as Windows XP, which are no longer supported by the developer and are therefore unpatched and vulnerable, become easy prey for zero-day and new generation attacks. Moreover, vulnerabilities in applications such as Java, Adobe, Microsoft Office and browsers are exploited by 90% of malware. The vulnerability protection module in Adaptive Defense 360 uses contextual and behavioral rules to ensure companies can work in a secure environment even if they have systems that are not updated. Get immediate alerts the moment that malware is identified on the network, with a comprehensive report detailing the location, the computers infected, and the action taken by the malware. Receive reports via email on the daily activity of the service. Adaptive Defense 360 integrates with SIEM solutions to provide detailed data on the activity of all applications run on your systems. For clients without SIEM, Adaptive Defense 360 includes its own system for storing and managing security events to analyze all the information collected in real-time. Forget about having to invest in technical personnel to deal with quarantine or suspicious files or disinfect and restore infected computers. Adaptive Defense 360 classifies all applications automatically thanks to machine learning in our big data environments under the continuous supervision of PandaLabs' experts.